Welcome to the French Riviera. 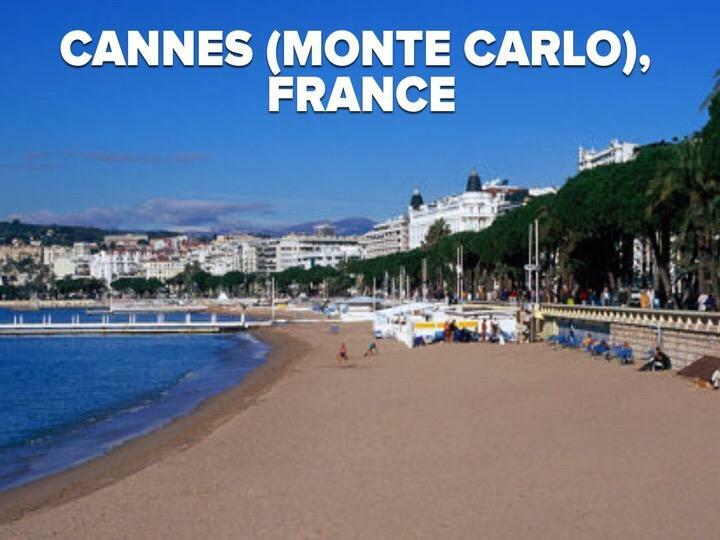 Once a small fishing town owned by monks, Cannes is now home to all the glamour of the International Film Festival and hosts a multitude of major festivals and conferences each year. On the coast is Nice, the capital of the Riviera that lies along the brilliant Bay of Angels. Monte Carlo is located in the Principality of Monaco, north of Nice on the Mediterranean Sea. Luxury hotels, a magnificent casino, the Formula One Grand Prix and home to royalty for centuries, Monte Carlo is a region rich in history, culture and beauty. Bienvenu! Monaco proudly bears the standard of dreams and glamour around the world, but it is ,above all,a tourist destination with a remarkable heritage. The whole country sums up from the view up the rock. "Oh, the perks of luxurious travel..private jets, big yachts.."
Our tour took us to a leisurely drive along the famous beach in Nice , the French Riviera. It was great to stop and walk in the park ,the promenade and checkout the antique market. Once we arrived in Monaco, it was simply breathtaking. We had about an hour of free time to walk around Monaco Ville where you can see the Oceanographic museum, palace, church where Princess Grace is buried, the amazing cliff side park adjacent to the museum and all the shops/cafes as well. We could have spent more time there as I think an hour is insufficient to have an indulgent lunch & savour the atmosphere. We then boarded the bus and went to Monte Carlo (which is really only a couple minutes away, just not easily walked). We had only 1 hour to walk around in Monte Carlo, but still enjoyed it. Right in front of the stairs that go up to the Casino, is the famous hairpin curve of the Monaco Grand Prix, which was really cool. I went inside the casino not to gamble, but to check the ladies room. Outside, the mid summer heat is taking its toll on us, took a quick snap at the Hotel Paris and in the gardens. We grabbed a gelato and people watched. It's simply beautiful. What a great way to spend Kelly's birthday!